I’m excited to announce the first post of the Wellness Wednesday series. I want to start this series by saying what Wellness Wednesdays are going to be, why I wanted to make this series, as well as give some legal disclaimers before going into this series. Wellness Wednesday is about taking care of yourself in all aspects. This isn’t to be confused with a diet or exercise plan, but really living your life to its fullest. It is about finding that balance of both your physical and spiritual life. This can include anything from chakra balancing to oils and herbs to cooking to exercise just to name a few. I wanted to start this series because when I approached my yearly physical training test for the Air Force in early April of this year. I realized how out of shape I have been. Even though I passed with a great score, that still didn’t hide the fact that I wasn’t taking care of my vessel of life. I’m 29 years old and I want to be sure that I remain here for many years to come. It isn’t enough to be here for those years though, I really want to have that quality in my physical life. As a witch I like to say, “if you don’t like the reality…change it”. This is me doing just that. 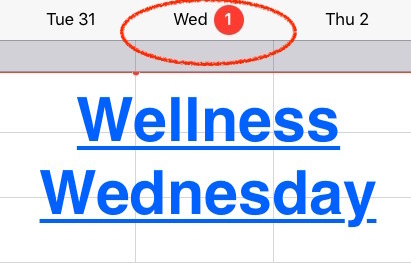 If you have any topics that you would like to have covered in Wellness Wednesday leave a comment or email me a question through the Contact Me Page and I will try to get to it as soon as possible. As a disclaimer, I want to say that I am not a health professional. I cannot stress enough that if you are looking to change your diet, start an exercise routine, or use/consume anything, consult your doctor first! This series is just me sharing what I do or what I’m trying in my life. I will not and cannot be held responsible for anyone out there that does not consult a medical professional first.